Scott Shearer - out after knock on the head on Saturday. Picture by Dan Westwell. The Mansfield Town side showed three changes for tonight’s visit of Yeovil Town. Keeper Scott Shearer missed out after taking a nasty knock to the head on Saturday. The club said yesterday he would be fine to play tonight but it was Brian Jensen on the team sheet after Shearer was believed to have suffered concussion. 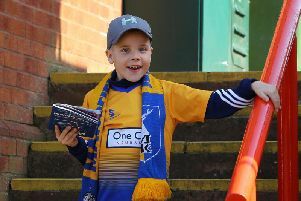 That left Mansfield without a back-up keeper on the bench. Skipper Lee Collins dropped back into defence in place of George Taft with Adam Chapman in to play the defensive midfield role. The other change was in midfield where Kevan Hurst was left out and replaced by Ashley Hemmings. Visitors Yeovil were unbeaten after taking four points from six in the League and winning their first round EFL Cup tie at Walsall to book a trip to Everton. STAGS: Jensen, Bennett, Collins, Howkins, Benning, Chapman, Clements, M. Rose, Hemmings, Green, D. Rose. Subs: Taft, Baxendale, Hurst, Hamilton, McGuire, Henderson, Hakeem. YEOVIL: Krysiak; Dickson, Mugabi, Butcher, Smith; Lawless, Dawson, Dolan; Eaves, Hedges, Khan. Subs: Maddison, Lacey, Zoko, Sowunmi, Campbell, Lea, Bassett. REFEREE: John Brooks of Leicestershire.